Port Botany is the state’s premier port and Sydney Ports Corporation is undertaking a major expansion of its container port facilities to cater for long term trade growth. Senior Project Engineer John Gadallah, assisted by Darryl Lange from Enerpac, selected RC-756 75 ton (718 kN) hydraulic cylinders to assist in striking the concrete segments weighing 220 tons or more. The hydraulic cylinders employ high-pressure, 700 bar, technology which reduces the cylinders’ weight and size while maximising their compact lifting power. The 29.5kg RC 756 hydraulic cylinder is just 285mm high with a stroke of 156mm. The hydraulic cylinders were used on sections of the concrete counterfort wall perimeter of the reclamation at Port Botany. The port expansion will require over 200 counterfort (rear buttressed) units weighing 640 tons each. The completed counterfort units are 20 metres in height, 9 metres wide and 15 metres long. Each 640 ton unit is cast in three segments, comprising a 220 ton base and a 240 ton front wall section which are assembled and connected via two rear buttress walls. The precast concrete is cured for 28 days and then positioned into the sea using a shear leg barge crane before reclamation work begins. The precast yard is producing one full counterfort concrete structure unit per day. More than a quarter of a million tons of revetment – concrete walling to prevent sea erosion – and scour protection rock will be placed around the counterforts. The Enerpac jacking cylinders were powered by an Enerpac ZU4 electric pump, although with time constraints on the project, a back-up petrol pump was available in case of power outages. The RC-756 hydraulic cylinders were positioned below the casting bed, making contact with the concrete through apertures in the bed. “The cylinders provide a break or striking action, so that the concrete castings aren’t damaged when lifted out of the beds,” said Mr Gadallah. “This procedure using hydraulic jacks is a standard practice which is an alternative to other mechanical means such as stripping the formwork from the concrete using turnbuckles or the like. 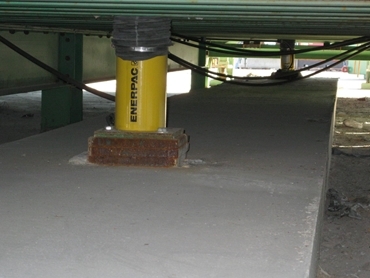 “The Enerpac hydraulic cylinders do the job well. This type of job doesn’t come around very often, but in the event that it did, we would consider using Enerpac cylinders for striking again if required,” he said. Undertaken by a Baulderstone–Jan De Nul consortium, the port expansion on which the cylinders were involved will create five new shipping berths along 1850 metres of additional wharf face, in addition to container storage. It involves reclamation of 60 hectares of land. The Enerpac RC-series of single-acting cylinders of the type used on the project are available in 39 models that range in capacity from 5-95 tons (45-933 kN). The cylinders’ plunger and seal are protected from dust and other contaminants by a cover sleeve. The high-strength alloy steel cylinders are part of an Enerpac range of safety-oriented, energy saving and labour-saving technologies, including lifting, pumping, fastening and maintenance tools. The ZU4 electric-powered portable hydraulic pump, from Enerpac (A Division of Actuant Corp) which has been used to power the RC-756 cylinders on the Port Botany project is a cool-running, energy-saving pump that sets new durability standards and lower operating costs. Typically weighing between 26-33 kg with reservoir capacities from 4-40 litres, the 700 bar pumps are suitable for use with powerful and compact single-acting and double-acting high-pressure hydraulic cylinders and hydraulic tools used throughout Australasian industry. The ZU4’s light weight and compact design make it ideal for applications requiring easy transport. Its universal motor works well on long extension cords or generator-driven electrical power supplies.